How Long Does It Take to Become a Court Reporter in Texas? How Much Does a Court Reporter Make in Texas? Court reporters create word-for-word transcripts of legal proceedings, meetings, conversations, speeches and other such events. Those court reporters who work in legal settings are responsible for producing a complete and accurate legal transcript of courtroom proceedings, depositions, and witness testimonies. 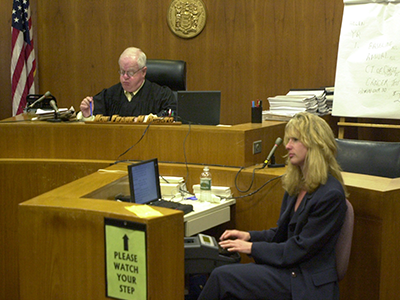 However, not all court reporters work in legal settings. They may work for hearing-impaired and transcribe speech to text for them. Some court reporters chose to work for themselves. All in all, it is a profession which is both fulfilling and rewarding. Texas is one of those states which employs the largest number of court reporters and pays them handsomely too. If you wish to enter this career in Texas then continue reading. If you want to become a court reporter in Texas then you must learn the profession of court reporting by passing tests and exams, getting certified and fulfilling continuing education requirements to remain certified. While there is no mandatory post high school educational requirements to become a court reporter in Texas, many prospective court reporters enroll in an accredited court reporting program. Such programs hone their skills and brighten their chances of employment. These programs may be offered by your local community college or technical institute. Depending upon your career path, these programs will either lead to a certificate or an associate’s degree. Once you have fulfilled the educational requirements, you will need to get certified especially if you intend to work in legal settings. This is mandatory since only certified individuals can engage in shorthand reporting in the state. If you chose to pursue a certificate program in court reporting, it will probably take you 18 months or longer to complete. However if you pursue the Associates of Applied Science Degree in Court Reporting, it may take you 2 years to graduate with full-time enrollment. Passing the CSR certification exam and criminal history verification check may take a few months. All in all, you are looking at a significant time investment in becoming a court reporter in Texas. Texas is the fifth highest paying state for court employers in terms of salary. According to the US Bureau of Labor Statistics (BLS), in May 2017, court reporters earned an annual mean wage of $72,630. Therefore, if you are thinking of pursuing a career in this field in Texas, you are on the right track as jobs are expected to increase in this field too in the coming years. According to BLS’s May 2017 statistics, Texas was ranked No.1 in terms of employment of court reporters in the United States. 1,640 court reporters were reported to be working in the state at the time. New York came second with 1,440 court reporters. Career outlook for court reporters in Texas remains bright. Once again, these are bare minimum requirements and therefore do not necessarily ensure your entrance into your preferred career. © 2019 How to become Court Reporter. All rights reserved.